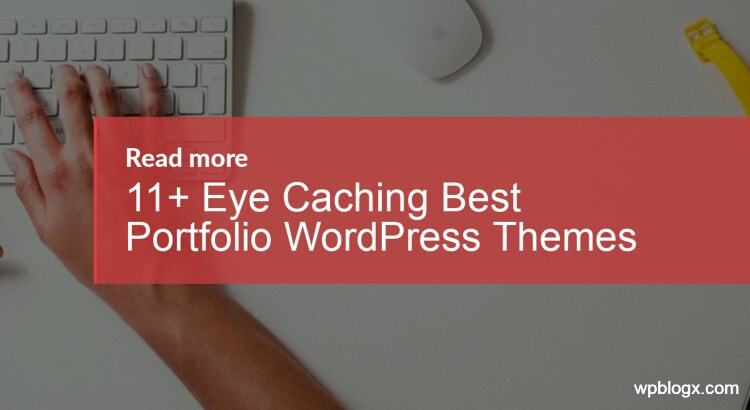 Are you searching for the best portfolio WordPress themes for your website? All these themes can be used by photographers, designers, creative professionals, business owners, artists, and anyone looking for a high-quality theme. The good portfolio must make users understand who you are and what you do just by looking at it. A portfolio is actually used to display the details of a particular company or an individual. They display their details such as a number of projects done, work experience etc. Earlier it was quite difficult creating a portfolio website because it would be time-consuming and requires technical stuff to work with it. But with WordPress, it is super easy to create a portfolio website with the themes available. There are hundreds of portfolio WordPress themes available in the market, but finding a suitable portfolio for your website would be a difficult task. But nothing to worry, in order to save your time and effort we have made a collection of best WordPress portfolio themes for your website. All these themes are responsive, high quality, advanced theme options, display a lot of content in a limited space, various portfolio pages, dozens of shortcodes, and many other additional features. Everyone must try these themes and make use of it. 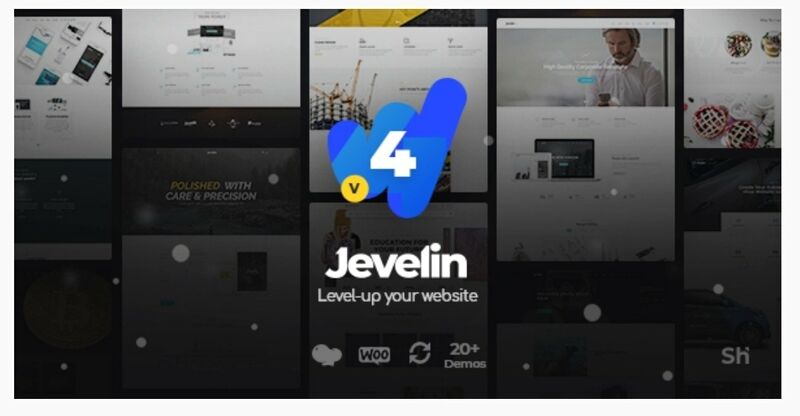 Jevelin comes top in our list for the best portfolio WordPress theme. This theme is simply superb with stunning graphics and highly resourceful. Jevelin is a premium WordPress portfolio theme that is very efficient and works hassle free. This theme is suitable for photography, artists, designers, professionals etc. Setting up and customizing your website with this theme is very easy as you can select your favorite demo website or page template. It has a built-in drag and drops page builder that lets you customize the layout within a couple of minutes, you can style your website as you wish. It has an advanced admin tool that allows you for deep and meaningful graphical and behavioral fine-tuning. 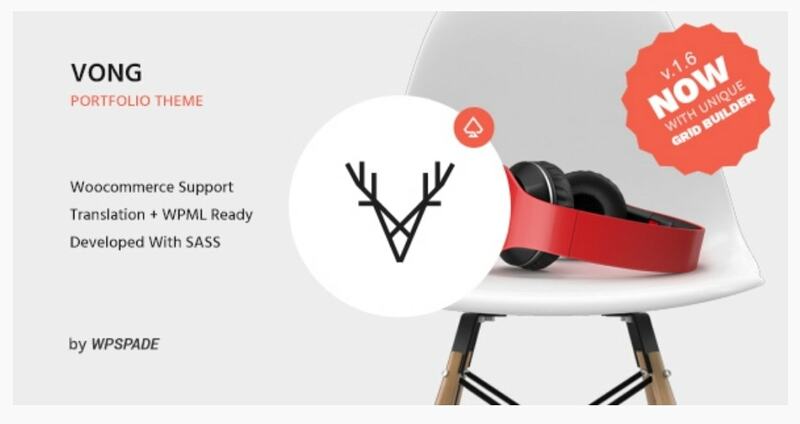 Jevelin theme comes with 40 shortcode elements that are ready to use and there are transitions and animations to style the header and footer. This theme is responsive and works effectively on all the devices such as smartphones, laptops, desktops, tablets etc. This theme gives you a high-resolution image and embedded video content. Jevelin is a lightweight theme that has a fast loading code and easy to handle. It gives you hardware powered parallax graphics effects that give a wonderful experience. Emmet Lite theme is one of the powerful WordPress portfolio themes which comes with a clean and professional design. This theme best match for corporate and portfolio websites. 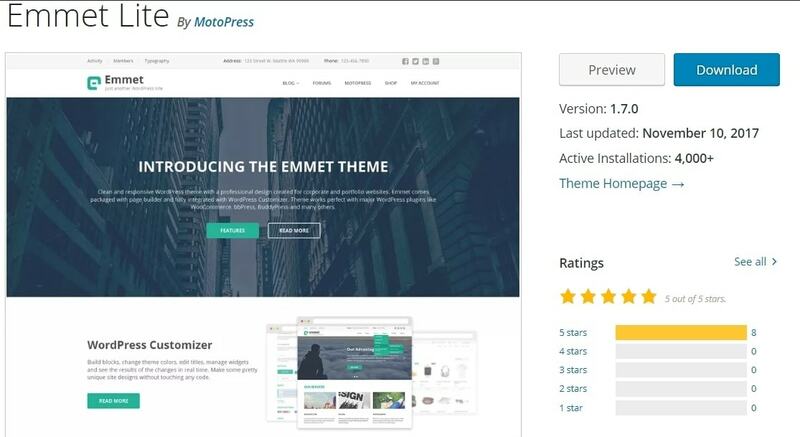 Emmet Lite theme is integrated with page builder and WordPress customizer so that it allows anyone to create a beautiful website without touching a single line of code. This theme can be handled by both beginners as well as advanced developers since it has a bundle of features. The theme is also integrated with many other third-party plugins such as WooCommerce, bbPress, BuddyPress etc. This theme gives you complete customization such as colors, fonts, menus, styles etc. Emmet Lite is user-friendly and works effectively on all the devices without any hassle. The responsive layout of this theme gives a great view to the visitors and attracts theme. This theme comes with translation ready so that at any time you can translate your website to whichever you want. Since it comes with a neat classy theme, it grabs the users view and increases traffic to your website. Once if a user engages to your website automatically it will increase your search engine ranking. With this theme, each of your blog posts is highlighted on the homepage. This theme is unique is for this simplicity and flexibility. 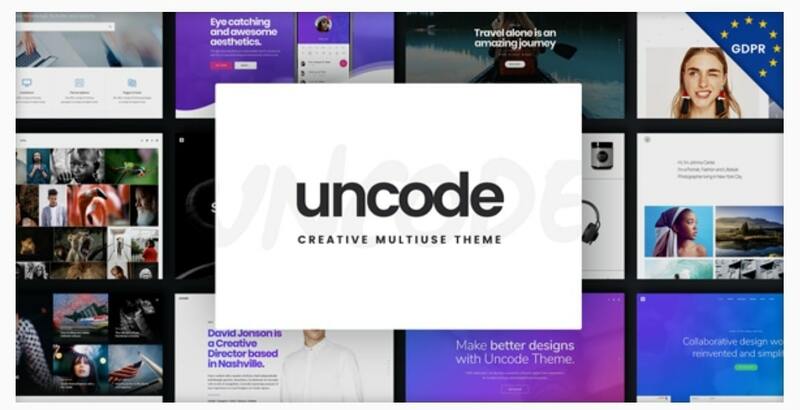 Uncode is an effective portfolio WordPress theme due to its appealing and satisfying design. This theme has customizable branding options and stylish layouts. This theme comes with 16 portfolio and blog post layouts with custom options. Uncode has a number of layout options, and there are 70 ways to display content including metro, carousel, and masonry layouts. This theme is integrated with an iLightBox plugin, LayerSlider, and Revolution Slider plugin. All the page layouts are handled with the Visual Composer plugin. It has 6 menu styles that enable you to create the right navigation that suits your website. You have multiple choices to choose fonts from Font Squirrel, Google Fonts, and Typekit. Uncode has 30 demos to install, and all the demos come with one click import. Uncode comes with extensive online documentation, video tutorials that help you better to work with. It is a perfect theme to display your portfolio. Brook is a multipurpose creative WordPress theme that gives a classy design for your website. This theme allows users to emphasize creativity and performance on their website. Brook comes with complete customization with rich layouts for blogs, homepages, headers, footers, and portfolios. The theme is also bundled with premium WordPress plugins that help to increase your branding and marketing. The theme comes with more than 30 homepage layouts and suitable for business, agencies, design firms, engineering, architecture, solo entrepreneurs, freelancers, and much more. 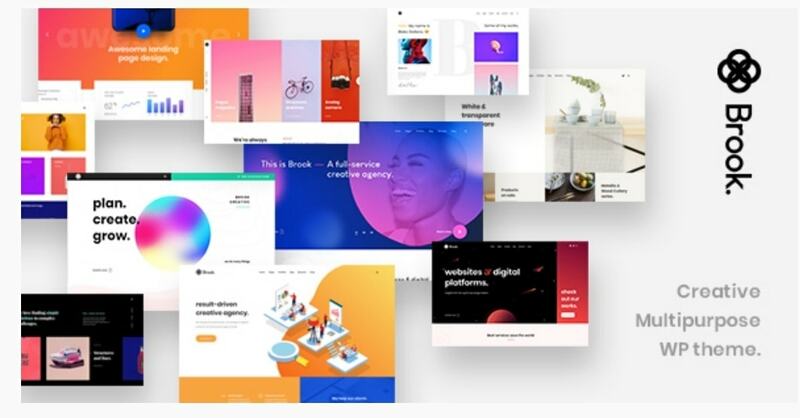 This theme gives the best user experience, whether your website deals with the single homepage, landing page app, a showcase of products, portfolios, e-commerce shop, services etc all these layouts work out of the box. It comes with a one-click import demo layout with minimal coding. With brook, you can customize shortcodes, colors, fonts, styles that help you to build a unique website. The theme is integrated with WPBakery drag and drop page builder that gives you a simpler approach to build a wonderful website. It is also integrated with WPBakery page builder clipboard that helps users to cut, copy, and paste media elements with affecting the main page builder. The theme comes with Awesome Pro fonts that help to style your text as you expect. Brook is retina ready and can be optimized for any devices and gives a wonderful user experience. It is worth spending money on this theme. 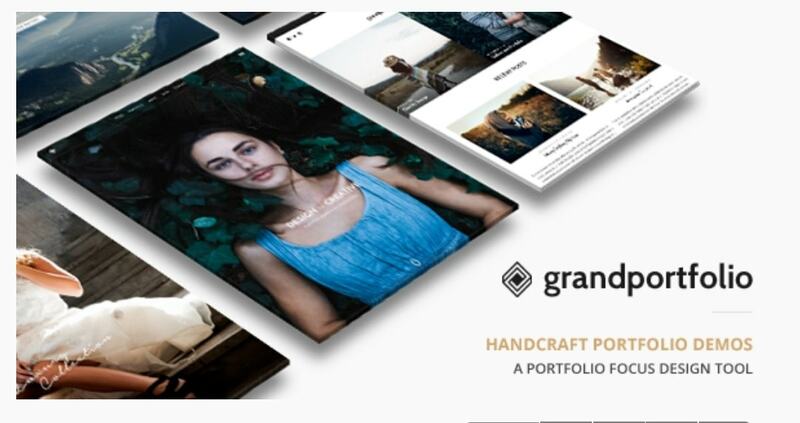 Grand Portfolio as the name implies it gives a grand and magnificent portfolio template. It is one of the most popular and powerful WordPress portfolio themes. It comes with an impressive layout that will definitely attract the visitors. The Grand Portfolio theme comes with plenty of design options so that you can create a beautiful portfolio website as per your wish. This theme will definitely satisfy all your needs and makes your website user engaged. This theme has several layouts to display gallery, pages, portfolio, blog, and other posts. All the essential elements and tools are integrated with this theme to build a stunning portfolio website. The theme is user-friendly and gives you complete customization. To work with a theme you need not require any technical knowledge. Grand Portfolio theme comes with two premium plugins such as Slider Revolution and iLightbox which helps to present you a classy website without a hassle. The theme has 70+ gallery and portfolio layout. Other features of this theme include drag and drop content page builder, real-time customizer, one click demo import, live editing theme typography, Google mobile compatibility, and much more. One of the worth theme to spend money on. Vong is one of the best responsive WordPress portfolio theme in the market. The theme is very easy to use and comes with a one-click demo import to get started with. You can build a professional, elegant, classy, modern looking portfolio website using this theme. The theme has masonry galleries, color palette builder, portfolio post style, unique navigation menu, layout header drag & drop builder, social sharing, and much more. The theme is compatible with WooCommerce so that you can sell items, offer services directly through your website. With minimal work, the theme gives you an aesthetic design. The theme includes other key features such as retina ready, localization files, WPML compatibility, team template to add contributors, and advanced portfolio settings such as 3 portfolio sizes, order by, lightbox, animated filter effects etc. 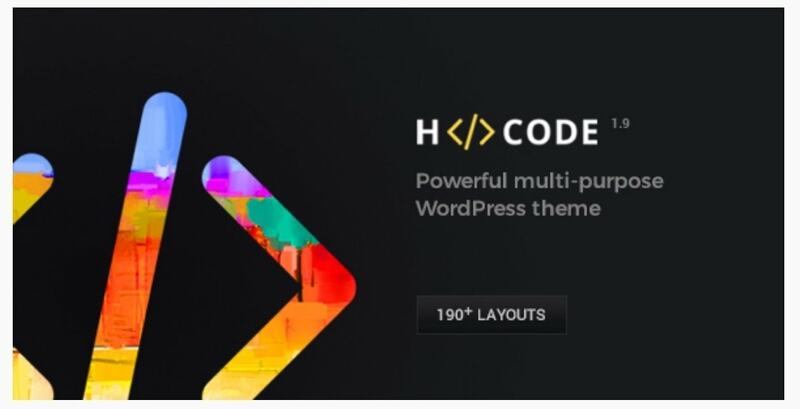 H Code is widely used multipurpose WordPress theme. This theme gives you a lot more features for the portfolio as well as for other fields. It is one of the notable themes for portfolio though it is a multipurpose theme. The theme comes with 57 demo homepage layout that gives you one-click demo import. The theme is integrated with free drag and drop Visual Composer plugin that helps you to create any custom layout as per your wish. H Code theme has 30 different listing page styles, 9 portfolio detail pages. You can build a more user-friendly website with this theme and attract your visitors. The theme also offers different styles for blog sections that look more trendy and modern. H Code is also compatible with WooCommerce plugin so that you can sell your products, offer services, and much more. There is also a one-page design that lets you create a website everything on a single page within a couple of minutes. The theme includes other features such as parallax effects, built-in mega menu options, shortcode options, typography setting, unlimited color options, video background options, under construction page, and much more. It is worth to use this theme to create a unique portfolio website. Kalium is yet another powerful portfolio theme that is designed to forecast your portfolio and blog with plenty of theme options and design layouts. This theme is also widely used all over the world to grab the viewer’s attention and increase their business standard. The theme comes with a nifty content builder. his theme helps you to build your own blog or portfolio from scratch within a couple of minutes. Kalium theme is translation ready using the WPML multilingual plugin so that you can translate your website to any language at any time. The theme includes the .po and .mo files. With this theme, you can create a professional, good looking website and the user can enjoy looking at your content all over the world. The theme is compatible with all the browsers and devices. Kalium has extensive documentation that gives useful information about the theme. The theme is integrated with Revolution Slider that gives you a versatile method of displaying content. You can customize as per your needs and also create your own animations and transition effects. The theme is also integrated with the Layer Slider plugin which helps you to create an eye-popping website. It includes other features such as awesome galleries, unique content sliders, wonderful effects useful slideshows, portfolio styles etc. Overall it gives you a complete look and feels user experience. Enigma is a fully responsive portfolio WordPress theme that comes with plenty of options and capabilities. Since the theme is completely responsive, it works effectively on all the devices right from small screen to big screen devices. 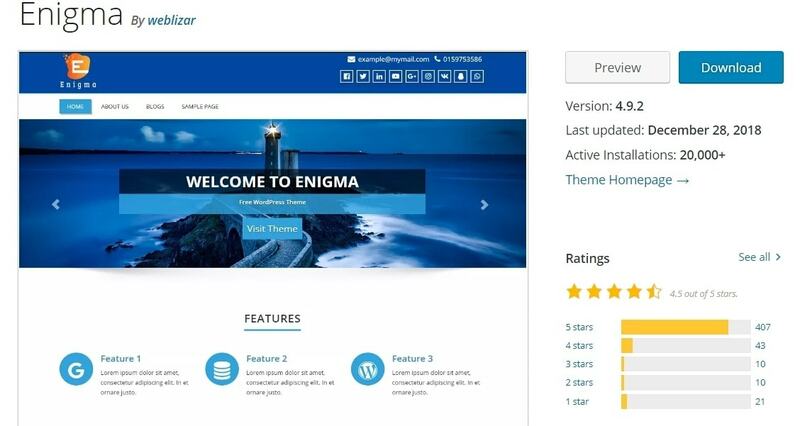 Enigma can be suitable for business, blogging or portfolio websites. This theme has strong support for WooCommerce so that at any time you can sell products, offer services through your website. The theme is entirely customizable and has 5 widgets. The dark and light skin gives you little flexibility in terms of branding. Enigma is a translation ready so that you can translate your website to any language. You can customize your logo, fonts, colors, styles etc. You can even customize the background and menus that are most important to state your business. The features images are revealed on the homepage as a feed for your most recent blog posts. With this theme, you can also choose sidebars and how many columns you want to display on your website. The theme comes with creative design and helps the user to understand without any hassle. Viewers can easily get your content and the entire look of the website is very classy. 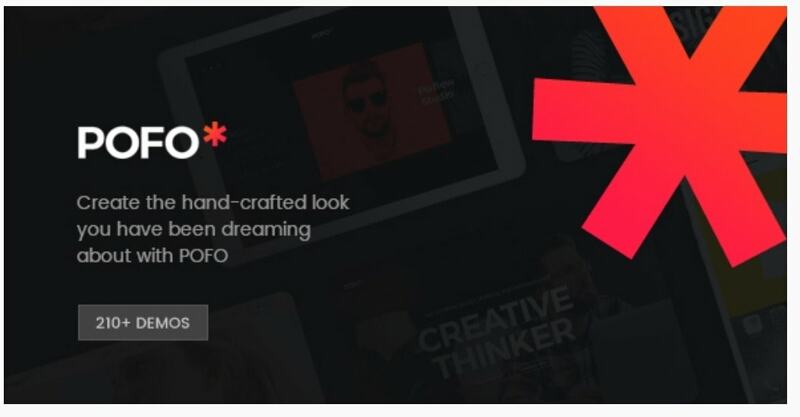 Pofo is a creative portfolio and blog WordPress theme. The theme comes with a modern design, high customization options. Pofo is very easy to use and the theme is completely responsible for all the devices without any interruption. The theme is suitable for agencies, photographers, bloggers, freelancers, creative teams, corporate business, artists, and other business to build a portfolio, blog and eCommerce website. This stylish theme comes with plenty of features that help you to build a stunning online portfolio website or blog. The theme has 25+ homepages, 150 pre-built elements, 200+sample demo pages etc. the theme is integrated with drag and drop WPBakery page builder that lets you create a website easily and also has a Slider Revolution plugin. The theme is well documented and you will be able to find answers to all your queries. A pofo theme is completely customizable so you can create a perfect website. 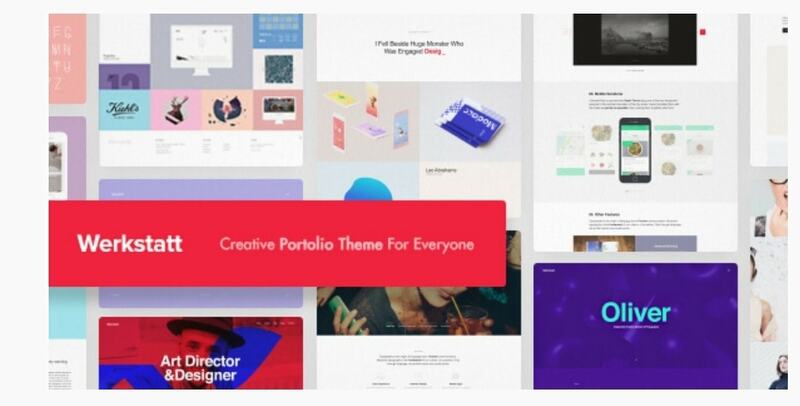 Werkstatt is a creative modern WordPress portfolio theme. The theme comes with a wide range of stunning layout options. It gives a chic and minimalist look which gives options to forecast your images and designs. The theme comes with 15 portfolio templates, drag and drop interface, 19 one click demos, and much more. The demos are created using Visual Composer and then each and every element can be moved from one to another easily. The theme supports WooCommerce plugin so that you can sell any products, offers services at any time directly through your website. Werkstatt theme is completely customizable and has plenty of features for you to work with and create a mesmerizing website as per your wish. It has 7 pre-built styles if you wish to create a blog section for your website. You can customize over 3000 fonts and make sure that your text is beautiful and classy. The theme helps you create a unique portfolio website with no doubt. Portfolios help you to increase traffic to your website. Creating a wonderful portfolio website will definitely make your website stand out of the crowd. Your website will make more user engagement and that results in increased SEO ranking. It is important to forecast your business and attract visitors. The above mentioned are the collection of best portfolio WordPress themes. These themes are carefully and beautifully created to showcase your portfolio. The above themes come with wonderful portfolio gallery templates, testimonials, amazing portfolio homepage layout, project, blog layouts, content page design etc. These themes come with stunning design and very easy to use. All these themes come with outstanding technology. It is not necessary that you need to be an expert in creating a website to use these themes. Even beginners can handle these themes effectively and create a rocking website with no doubt. Hope you got an idea about the 11 best portfolio WordPress themes. If you have any queries or if you find any other theme that is best and not mentioned in this list please feel free to share to us. It might be useful for the upcoming readers. You can subscribe to us at Facebook and Twitter. Effective ways of How to Include Shopify to WordPress with WP Shopify?